The Asia Pacific Dental Congress (APDC) is the main event in the field of dentistry in the Asia Pacific region. In 2018, APDC was co-located with the Philippines Dental Association annual convention (PDA) and it took place in Manila. See how it was possible to be done smoothly in a challenging venue.
" We wouldn’t have a very successful congress if not for your great support to the Local Organizing Committee. Allow me to extend our sincerest gratitude to you both and your group. You guys did a great job.	" The 40th Asia Pacific Dental Congress (APDC) is the main event in the field of dentistry in the Asia Pacific region. 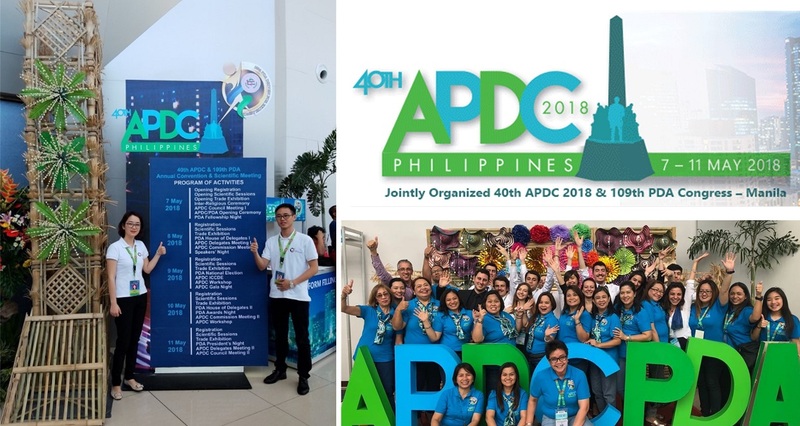 In 2018, APDC was co-located with the Philippines Dental Association annual convention (PDA) and it took place in Manila, Philippines. The challenge in this situation of joining two congresses came from SMX Convention Centre – the largest purpose-built venue in Manila which was booked for the event. The infrastructure was designed to host in certain areas fewer people than those that were expected to join the event. Avoiding queues in the registration area, which was one of those problematic locations with an expectation of over 14,000 delegates, was a big question, while ensuring a safe and comfortable experience for all participants. Further to this, the Kenes team was tasked to develop a system to monitor the session attendance of every single delegate. The Continuing Professional Development (CPD) issuing bodies needed this validation in order to provide to correct personalised certificate including the attended sessions of each participant. Registering over 14,000 people at a location which could not accommodate so many people comfortably was a big issue. Queues would be one issue, but also there was an obvious risk for the safety and security of all delegates and staff. With only one available venue at the selected destination to host this event the team had to think creatively. The Philippines Dental Association has over 16,000 members who are used to register for PDA’s congress directly with the association. 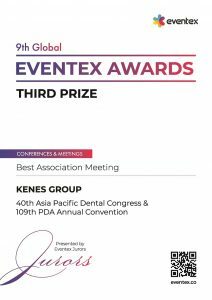 The Kenes team quickly adapted the registration software to support PDA with the import of excel data for faster manipulation. Already in March, three months before the event, the registration software held all the needed data which allowed the team to bring their printing tools and prepare during their last site inspection over 14,000 badges. More than 9,000 of them reached participants on time before the event. These RFID equipped badges were included in the complete registration package sent in advance by both APDC and PDA. The badges that successfully reached the delegates were tracked via a barcode number which every delegate was encouraged to register on the congress website. One week before the event, there were still more than 6,000 delegates that would have to register on day one. For that, the onsite team decided to open the registration desk during the set-up date and announce early registration. A few thousand people used the opportunity allowing day one to start smoothly, without queues and with happy delegates, where only 1,200 people registered onsite. Solving early on the registration challenge allowed the team to introduce a solution to tracking the delegate session attendance during the event. The barcode and RFID chips included in all badges allowed to track the people flow between the 13 halls used for the event. For the three bigger halls with a capacity of 2,500 people, RFID was used. For the ten smaller halls – barcode scanning was executed. This system provided the information needed by issuing bodies on the sessions that each delegate attended so that the correct CPD credits can be given. A year earlier PDA expected around 4,000 participants to attend their 2017 event but they ended up welcoming over 13,000. While this can be considered as a huge success, the association had a lot of issues onsite lacking the support of an experienced professional conference organiser. With APDC selecting Manila for the 2018 congress, the two associations took the decision to combine both events for the important mix of knowledge between the associations’ members. But together they also realised the issue fitting all delegates comfortably in SMX and solving so many logistical problems that arose around it. With APDC’s experience in working with Kenes for a few years already, they entrusted the team with this challenging task. Once PDA saw the capacity of the team, they knew they were in good hands. This meeting is the biggest event that PDA and APDC have held in their history. Additionally, the event allowed Kenes to introduced new technological solutions to the Philippines. Even if the locals insisted on the conservativeness of their audience and the claims for a low adoption rate, this event proved otherwise. I would like to thank you and the Kenes Group for all the work done for the convention. The smooth flow of the convention was partly because of your good work. We hope to collaborate with you on other PDA project perhaps. I will always put in a good word for you and the Kenes Group.